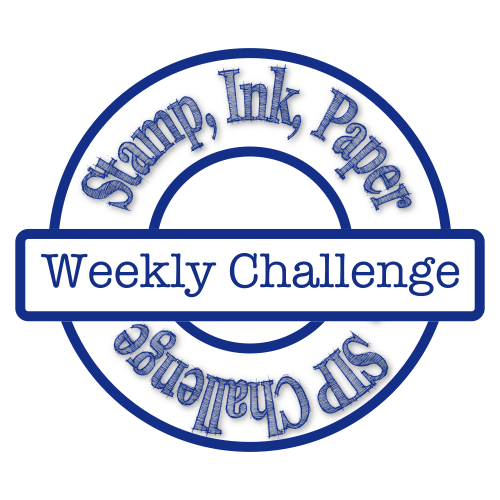 Hey there and welcome to another week of Stamp, Ink, Paper! It is been an eventful week in The Tucker house! One child with a sprained foot, while on my way home from doctor my foot turned into lead! Speeding ticket for this girl... First moving Violation in 17 years!! Cop said I was the first person he has seen pull over before he even got completely turned around and his lights on... Oh Well what was I suppose to do? The youngest has an ear infection!!! BLAH! New week new attitude LOL! Right!? 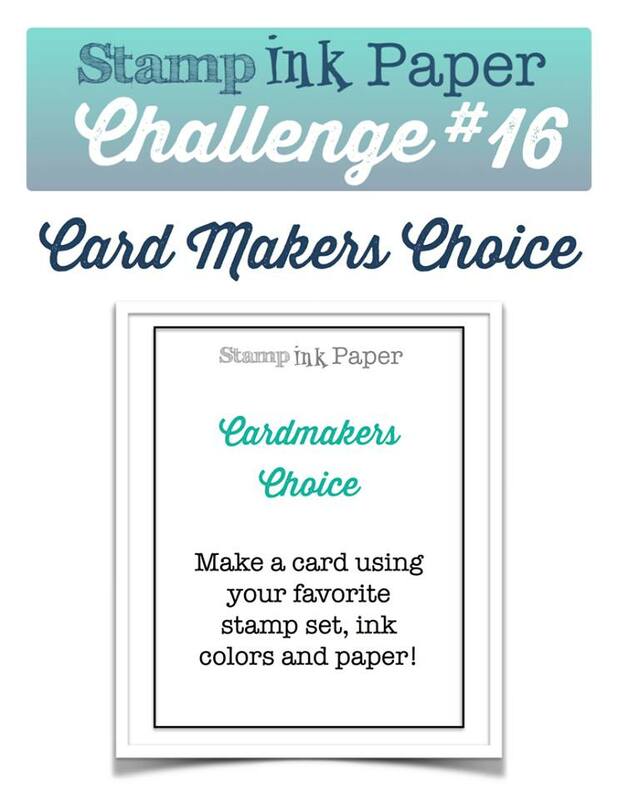 Well we have one of our favorite challenges for you this week! No Rules! 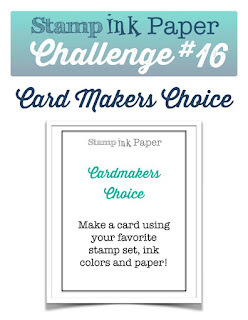 Make a card using your favorite stamp set, ink colors and paper! 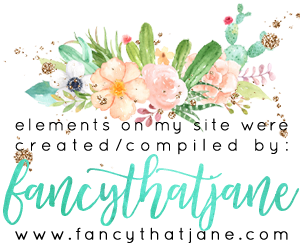 I took the opportunity to use something from Stampin' Up! Holiday Catalog that I hadn't yet used! So this card started to come together in a really weird way... No rules right!? I had purchased the tag on the left a while ago... They happen to be sitting on my work space when I went to my craft room this morning. After some creative collaboration with Tina Riddle on the phone I knew that I wanted to use Basic Black, Real Red and Whisper White. Not only did I know what my colors were going to be, I knew that I wanted it to be a Christmas card. I hadn't used my Peaceful Pines bundle yet. Today was my window of opportunity! The bundle is amazing with 3 different tree sizes and thinlits to "Decorate" the trees! I stamped the Big Red Tree using the bundle. 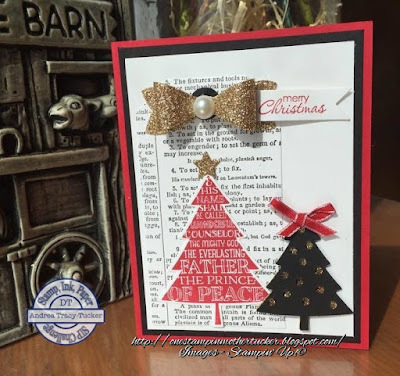 When I took out my big shot and the dies to go with stamp set I knew I needed to another tree as well so I cut the black tree and used the a die to make the little holes in it so that the gold glimmer paper shines through. I also used the gold glimmer paper for the star at the top of the red tree. The bow on the tag was made using our ever so cute Bow Builder Punch with our glimmer paper with a big pearl on top. The "Merry Christmas" sentiment is from our Petite Pairs set. I simply stamped this in Real Red and then used the Bitty Banner framelits to cut out! I know not your "normal" Andrea card... I really love the way it turned out! Labels: Christmas Cards, Holiday Catalog, SIP, Stamp Ink Paper, Stamp Ink Paper Challenges, Stampin Up, Stampin' Up! Gorgeous Christmas card, Andrea! Love the colors and the pops of gold!